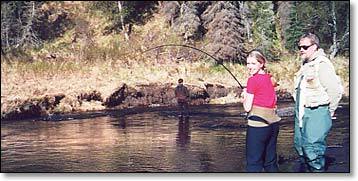 Guided river fishing Alaska - Homer and Kenai Peninsula on the Anchor River, Ninilchik River, Kasilof River, Deep Creek and Homer Spit lagoon. Fishing king salmon, silver salmon, trout and steelhead. Do you want to go fishing, but are unfamiliar with the regulations, and how to fish the lower Kenai Peninsula? Let Silverfin Guide Service show you how and where to fish, by offering a quality, fun, educational fishing adventure for the family, fishing enthusiast or novice. Our goal is to provide the best fishing experience possible, while keeping costs reasonable, especially in these tough financial times. We can take up to six people at one time, or more if all from one party. 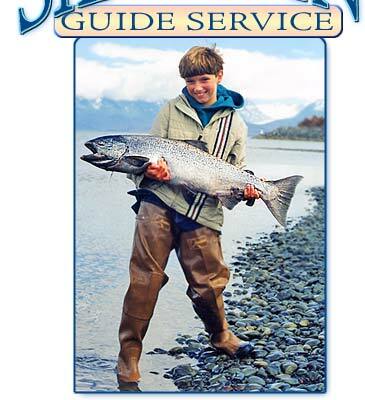 Silverfin Guide Service offers an exciting variation to charter boat fishing, by conducting "walk and wade" fishing adventures on local area streams or the Homer Spit. We fish mostly for King and Silver Salmon, Steelhead and Dolly Varden Trout. Fishing these Alaskan waters can be phenomenal, especially when hooking a large salmon or steelhead. Fishing from the river bank or shore, rather than from a boat. Teaching the many aspects of fishing successfully from land. Allowing a more “hands on” fishing experience. Creating more flexibility in trip length. Using light, sensitive tackle, for a challenging "fish on" fight. Enjoying nature trails, wildlife and the benefits of walking. Gary Sinnhuber, (owner/lead guide), has enjoyed fishing in Alaska since 1976, and started Silverfin Guide Service in 1999. As a licensed sport fishing guide, Gary is insured and permitted for fishing the area state parks, and is a member of the Homer Chamber of Commerce. Gary learned how to fish the creeks and rivers for trout and salmon as a young boy, growing up in coastal Oregon, thanks to the patient teaching of his father. Gary's daughter, Rose, fights a King Salmon, while Dad coaches her. Fishing May through October, Silverfin Guide Service provides all necessary gear, including rods, reels, premium bait, flies or lures, and hip waders. 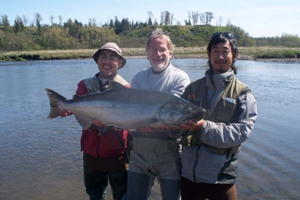 We can walk and wade fish at the easily accessible Homer Spit Lagoon, or scenic rivers, including the Ninilchik and Anchor Rivers, and Deep Creek, where every bend in the river gives promise to another fish. Customized adventures are available daily, from half to full day, with the extended half day (6 hrs.) being the most popluar. For the budget minded traveler in these uncertain economic times, you'll find that our prices are significantly lower than the usual charter boat trips. Items you will need to bring with you: Warm clothes in layers, including extra warm socks, raincoat, a sack meal or snacks, an Alaska sport fishing license and King Stamp, if fishing for King Salmon. A fishing license and King Salmon stamp can be obtained at several locations in Homer, or online at the Alaska Department of Fish & Game website. The fish will be bled and cleaned. Nearby fish processing facilities can cut, package, freeze and ship your catch, if so desired. Coal Point Seafood Company on the Homer Spit can take care of all your processing needs. Silverfin Guide Service is ready to take you fishing, and we are always happy to answer any questions you may have. We hope to hear from you soon.